The Solar and Heliospheric Observatory (SOHO) is a spacecraft built by a European industrial consortium that was launched on a Lockheed Martin Atlas II AS launch vehicle on December 2, 1995 to study the Sun, and has discovered over 3000 comets. It began normal operations in May 1996. It is a joint project of international cooperation between the European Space Agency (ESA) and NASA. Originally planned as a two-year mission, SOHO continues to operate after over 19 years in space. In June 2013, a mission extension lasting until December 2016 was approved. In addition to its scientific mission, it is the main source of near-real-time solar data for space weather prediction. In normal operation the spacecraft transmits a continuous 200 kbit/s data stream of photographs and other measurements via the NASA Deep Space Network of ground stations. SOHO’s data about solar activity are used to predict coronal mass ejection (CME) arrival times at earth, so electrical grids and satellites can be protected from their damaging effects. CMEs directed toward the earth may produce geomagnetic storms, which in turn produce geomagnetically induced currents, in the most extreme cases creating black-outs, etc. In addition to its scientific contributions, SOHO is distinguished by being the first three-axis-stabilized spacecraft to use its reaction wheels as a kind of virtual gyroscope; the technique was adopted after an on-board emergency in 1998 that nearly resulted in the loss of the spacecraft. 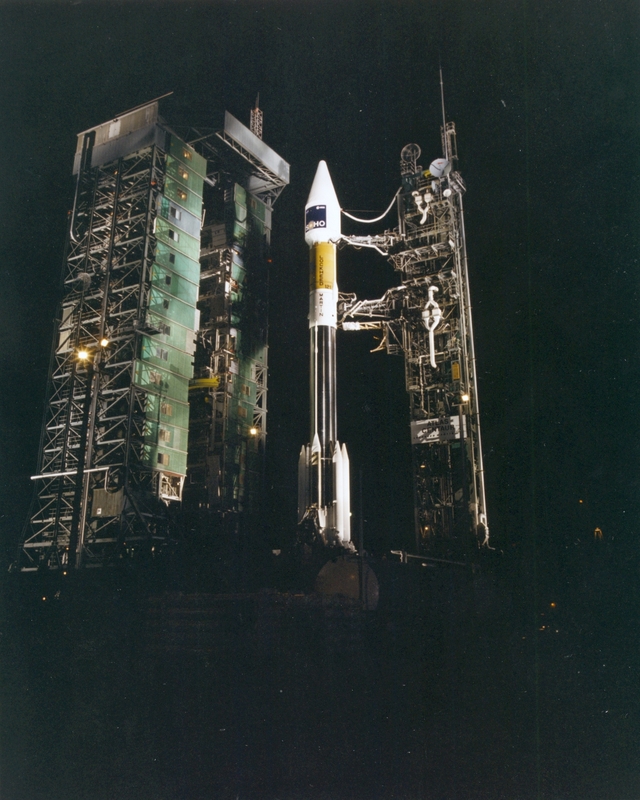 SOHO was launched by an Atlas II-AS (AC-121) from Cape Canaveral Air Station on December 2, 1995, at 08:08 UT.